Apologies received from CCllr Rodney Rose. The Minutes from the December Meeting were discussed, agreed and then duly signed, dated and filed. These were briefly reviewed and the Clerk was asked to carry this forward to the February meeting. Cllr Carter discussed the PC’s expected expenditure for the forthcoming year and agreed to prepare a list in order of priority and present it to the PC at the February meeting for further discussion. Cllr Carter reported that this was one of the PC’s largest items of expenditure and that it was up for tender. She reported that she had received one quotation from the current contractor. The Clerk was asked to advertise this to obtain further quotations. These would be discussed and a decision made at the February meeting. Cllr Carter reported to the meeting that the Clerk’s computer had broken and was not repairable. The Clerk had needed to invest in a new Laptop computer system and had asked if the PC would consider donating something towards its purchase price. The Clerk left the room whilst the councilors discussed this. After discussion, the Clerk returned to the meeting and the PC gave her two options, the first being they would purchase the Laptop outright and it would become the PC’s property or alternatively they would give 50% of the purchase price. The Clerk thanked the PC and accepted the alternative option and agreed to provide the PC with a copy of the receipt for the Financial Officer’s files. A cheque will be raised at the February meeting. Oxfordshire’s Chief Fire Officer and the person responsible for managing the Olympic Torch route through the County have been named in the Queen’s New Year’s Honours list. David Etheridge, who joined Oxfordshire County Council’s Fire and Rescue Service 28 years ago, has been made an OBE while County Network Co-ordinator Katherine Powley has been awarded the MBE. Congratulations to all those who have received Honours from the Queen. 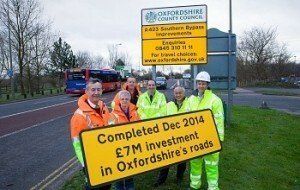 Ahead of Christmas work was completed on the £7m A423 Southern Bypass Scheme at Hinksey and Kennington Roundabouts. Work began in June to introduce a “hamburger” layout to the Kennington roundabout, which will increase capacity by up to 30% to cope with current and future traffic demand, as well as completing refurbishment of four bridges and the carriageway surface between Hinksey and Heyford Interchanges. The works have also included a new subway to take foot and cycle paths beneath the new lane on Kennington roundabout. Improvements have also been made to Hinksey Hill interchange with a ‘free flow’ lane added to the A34 southbound on slip road. Work on a series of multi-million pound transport improvement projects is to start in January 2015. Schemes on London Road, the Plain in Oxford City and Milton Interchange will all get underway, marking the latest phase of investment in the county’s transport infrastructure and future economic success. The work is designed to be phased but some of the funds are dependent on spending within a certain time frame. If a project were to be deferred, it would mean some residents would not benefit from improvements. It was welcome news that we were given 6 year road maintenance funding as it will enable us to plan over a longer period with certainty of funds. In line with the Government’s plans to reduce public spending to cut the national deficit, the County Council has made savings totalling £265 million. With £20 million of additional pressures coming from Adult and Children’s Services the level of savings from 2010 to 2018 totals £285 million. As with previous budgets, there will be some very difficult decisions to be taken to deliver a balanced budget in February. If Central Government funding is to be further reduced the County Council is exploring how we can achieve more devolved powers to determine what is best for Oxfordshire. The Government has announced that the referendum limit will be at 2% for the coming year. We had been preparing the budget on a 1% limit to obtain the top-up ‘freeze’ grant, however that adds a pressure of £3.1 million to the medium term plan. If we decide to increase council tax by 1.99% we may decide to add the funds to the reserves to try and protect the council from future cuts from Central Government funding. You can make comments on the budget proposals until 9th January 2015. Following this the Performance Scrutiny Committee, chaired by the Leader of the Opposition, will consider the proposals. Comments will then be fed back to Cabinet for them to take into consideration in advance of proposing their budget and Medium Term Financial Plan 2015/16 to 2017/18 (MTFP) in January 2015. The MTFP will then be debated by a meeting of all 63 county councillors in February, when the Council will meet to agree a budget and set a Council Tax level. The County Council is exploring ways in which further powers can be devolved to local authorities. On 16th December, the Leaders of Oxfordshire, Buckinghamshire and Northamptonshire, Ian Hudspeth, Martin Tett and Jim Harker OBE, jointly signed a bold offer to Government to unlock further economic growth and significantly build on the £45 billion value of goods and services that the area already generates. In the offer, called ‘A shared approach to driving prosperity’, the three councils call on the Government to work with them to develop a brand new ‘combined authority’ alliance focused on their common economies of innovation, science, technology and creative industries. Please note that it is NOT about a super Unitary authority, as each council will have its own sovereignty and will make the final decision regarding any proposals. There is no intention of merging councils, however if this is successful then we may look at other common areas to work together to be more efficient. The county council website provides a considerable amount of advice on how to mitigate problems from the winter weather, including guidance from the Highways Agency and Central Government. There is a particular focus on travel and what residents can do to help us before and during emergencies. We are committed to keeping a network of major roads free from ice to minimise the risk of accidents and ensure the smooth flow of traffic. Precautionary salting (sometimes called ‘gritting’) helps achieve this aim. Gritting teams have already been out in November due to falls in overnight temperatures. The County Council’s website displays a considerable amount of information including up to date information on road surface temperatures that indicate when and where gritting will take place. It also shows the roads that are routinely salted during the winter. The page also links to general advice on dealing with snow and ice, and school closures. Daily updates on the roads are also sent out via twitter for those following @oxfordshirecc. We would like your views to find out if the Childrens Trust is on the right track, so it concentrates on the areas that are most important to you and the young people of Oxfordshire. The Children and Young People’s Plan drives the work of the Children’s Trust and is jointly authored by all of the Trust’s members. It is based on evidence from the Oxfordshire Children’s Needs Analysis 2014. The Children’s Trust wants Oxfordshire to be the best place in England for children and young people to grow up in, by working with every child and young person to develop the skills, confidence and opportunities they need to achieve their full potential. As in previous years, Oxfordshire County Council is undertaking a consultation regarding the fees paid to care homes. The Council recognises the need to ensure that good quality care is sustainable and properly funded, and we are mindful of our obligations to consult with providers regarding this matter. We would therefore like to invite you to participate in this consultation and share with us your views on care home fees for 2015-16. Your views will then be shared with and considered by Cabinet in making decisions about future care home funding. Oxfordshire County Council has maintained its position as one of the best counties for recycling of waste in the country, coming top in 3 of the 7 categories. Figures compiled by the Department for Environment, Energy and Rural Affairs (Defra) show that Oxfordshire had the lowest amount of residual waste per household in the country. The county was also top of the tables for recycling & composting percentage and dry recycling percentage and where the best performing county council for household waste per head. Plans for a ‘move-on’ home for older teenagers preparing to leave care and make the transition to adulthood are set to be unveiled in Witney. The council is proposing to build accommodation for up to four 16-19-year-olds as they develop independence skills, attend college or enter employment. The move-on home, at the former Moorlands Centre on Dark Lane, would help keep vulnerable young people safe, enabling them to live closer to home as they prepare to leave the council’s care. It is one of four new residential developments planned across the county for children in care or at risk of coming into the care system. There were no members of the public. Cllr Carter reported that the training session was very successful and very well attended. It had been agreed to set another date in early March for training. Cllr Carter reported that the function room at The Swan had been booked for Thursday 12 February. The Clerk was asked to confirm this with Shipton and Milton. It was reported that nothing further had been heard. Cllr Carter had drafted a letter to send detailing the PC’s disapproval at how this was handled by WODC and Cottsway. This was discussed and Cllr Carter agreed to add a request for an update on the tenancy situation and the property being vacant with lights on. Cllr Tribe reported that he had met Dan Weeks from OCC, together with Nigel Braithwaite on site. Dan Weeks agreed that the river bank was being eroded and that he was confident there was funding to carry out the repair works. Cllr Tribe agreed to keep on top of this. The Clerk reported there were no new applications to consider. She reported that WODC were now emailing a list of all planning applications to be considered and decisions made. The PC confirmed they would like her to forward the lists to them only if they included applications in Ascott and Shipton. Cllr Mellor reported that there had been another problem with Moles. Cllr Carter reported that the renovated playground was now complete and open. She had received lots of positive comments, with the exception of one neighbouring property who she would speak with. Cllr Mellor reported that he had been working with Dr Iain James of TGMS to further develop proposals to OCC Highways Dept in order to obtain their permission to allow run off water to enter the highway drains adjacent to the sports field entrance. Dr James had proposed creating a test soakaway on the ground just inside the entrance gates on the right, which is often used to park cars. This would allow an infiltration test to be undertaken as this was something OCC would expect to done, hopefully the data would support our request. He suggested that a local contractor be approached to undertake the work which would be paid for from the grant made by Sport England. Cllr Mellor will identify a contractor and communicate contact details to Dr James. Cllr Mellor had also updated Thomas Andrews, Case Manager, Sport England on this development and would keep him informed of progress. Richard Smith is preparing the legal documents required for the project and he had also been updated. Cllr Carter reported that the signs advertising this were up and that some parishioners who couldn’t make the date were happy to Litter Pick on a different day. Nothing to report – please refer to Item No. 13 Litter Pick. Cllr Tribe reported that Defra and Oxfordshire County Council Waste Strategy had replied to him regarding the lack of a waste disposal site, in particular the proposal for a site to be opened in Kidlington, which had now been shelved. Cllr Tribe agreed to write again. The Clerk was asked to carry this forward to the February meeting. Cllr Rance reported that he would be attending the Parish Transport Representatives meeting at County Hall on Friday. He reported on the email from The Wychwoods & Burford Bus Service and confirmed that he would co-ordinate a consultation with the parishioners and take their views and any questions with him to the meeting. Answers to the OCC consultation must be in by 13 February 2015. Cllr Carter reported that this was a very successful and enjoyable event, which was extremely well attended. She reported that £305 was raised, which was donated to The Wychwood Day Centre. Cllr Mellor asked the Clerk to minute the PC’s thanks and gratitude to Robin Walker and Shane Barnes for erecting and dismantling the Christmas tree, to Debra & John Cull, Mary Barnes and Ingrid Ridley for heating the mulled wine and finally to the members of the Band. Cllr Timms reported that she had attended a recent meeting at the Library, which was very positive and evident that the level of volunteer help was good. Cllr Timms reported that she would be attending a meeting on the 26 January and would report back accordingly. 2015 Meeting dates – all agreed these would continue to be the second Monday in the month, with the exception of August when there is no meeting. A date for the Village Meeting will be set at the February meeting, the Clerk was asked to add this to the Agenda. Grapevine Article – Cllr Carter asked the councilors to give this some thought and let her know if there was anything specific they would like to be included. There being no further business Cllr Carter declared the meeting closed at 10.20pm and confirmed the next meeting would be Monday 9 February 2015 at 7.30pm.